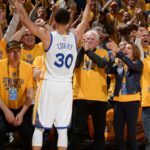 Embedded below are a series of videos on the unique screening Golden State does in transition for Klay Thompson. With multiple players capable of pushing the ball off defensive rebounds, Golden State is on so dangerous off misses. On the corral of the rebound, Klay Thompson sprints to the nearest corner looking for a pitch-ahead 3. 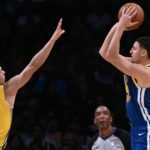 However, Thompson doesn’t just stay there, he will often drift inside the 3-point line and run through the paint to the other side of the floor. If a Warriors teammate recognizes this, he will set what I have termed a “X” (simply because I didn’t have any other name for it – let me know if you have heard something you like better). Something else the Warriors will do in transition is set a flare screen for Klay. If a teammate happens to be running the same side as Klay, he has the ability to screen the backside of Klay’s unsuspecting defender.